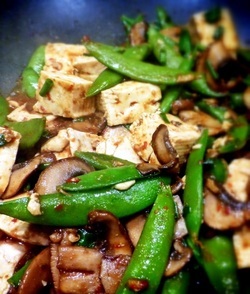 This recipe uses no garlic, no shoyu, lots of fresh ginger and lots of fresh sugar snap peas. And surprisingly, I do like it. Even more surprising, it's vegan and my husband likes it! As noted, this recipe is descended from a Bon Appetit recipe that used beef, snow peas and shiitake. Obviously, I made a few substitutions and adjusted the spices--especially the hoisin sauce. Sugar snap peas and the baby portabellas hold their texture a little better than snow peas and shiitake, respectively. I needed this because the tofu is a much softer texture than the original beef. Drizzle sesame oil into a wok. Add fresh ginger and mushrooms and cook until the mushrooms start to release liquid. Add snow peas and stir fry for 1 minute. Add hoisin, chili-garlic sauce and five spice powder and stir to coat. Add tofu and green onions at the end and stir-fry until tofu is heated through, about 2-3 minutes. 1) With a tofu/veggie stir-fry, undercooking is not so much of an issue. 4) It was suggested to add waterchestnuts for more 'oomph' on the bite. A very good idea.